Vtg MAGIC ACTION Battery Operated TIN LITHO toy CIRCUS LION TRAINER Japan 50's. 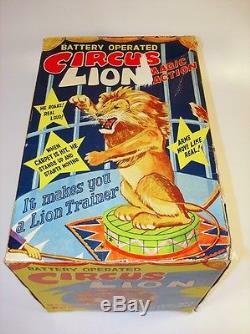 Vintage MAGIC ACTION Battery Operated TIN LITHO toy CIRCUS LION TRAINER Japan 50's. Lion toy in excellent (original, unrestored) cosmetic and working condition. Complete in original box with internal packaging. Mohair lion with realistic shag mane sits atop tin litho pedestal. Small spots of fur (top of head, hips) flattened from storage in the box. Box tears have been carefully repaired with conservator's glue, some corner edges left separated. Lion toy functions perfectly, with loud roar, body rearing up from hind legs. Battery compartment is spotlessly clean. Requires 2'D' batteries (not included) to operate. Whip has been replaced with a modern plastic replica. Original carpet required for use with the toy is in very good condition, with light wear, portion of asian handwriting in pen on underside of one corner. Made in Japan in the 50's by VIA/ Rock Valley Toys. Questions will typically be answered the same day, or even immediately. _gsrx_vers_526 GS 6.6.6 (526). The item "Vtg MAGIC ACTION Battery Operated TIN LITHO toy CIRCUS LION TRAINER Japan 50's" is in sale since Sunday, March 20, 2016. This item is in the category "Toys & Hobbies\Electronic, Battery & Wind-Up\Battery Operated\Pre-1970". The seller is "andy_man_100" and is located in Ottawa. This item can be shipped to Canada, to United States.